Brand: K. N. Biosciences (India) Pvt. Ltd.
DBACT is a consortium of decomposing microbial cultures with high performance. Decompose of Press mud, Poultry manure, & agriculture wastes like banana leaves, sugarcane waste, Paddy straws and other farm wastes, kitchen waste, etc. It decomposes within 40-45 days only i.e. depends on waste material. D-bact is not only for decomposing, it prevent and control soil born fungal and bacterial diseases and even soil pest. 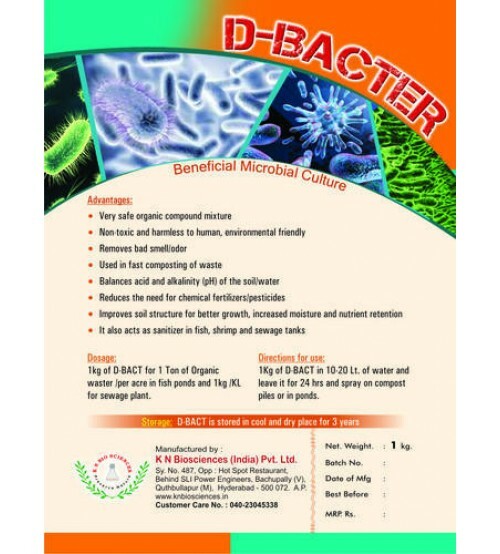 D-bact increases organic carbon and helps in healthy plant growth. Use 1 Liter / kg of D-bact mix with 200 Liter of (if possible add 1 kg black jiggery solution) water and spray / spread on 1-2 MT of press mud/poultry manure / agriculture waste material.